Chloe’s adjusting to her new found fame, so it’s time for us to catch up with her and see what she’s been getting up to! This last week has been a really busy one for me. We attended a large fire at a recycling plant. l went with my crew from Outwell station as a relief team to give the other crews a well earned rest! The fire was the biggest I’ve confronted so far, it was only smoldering in places but still very warm and smokey. This was a great experience as I was able to get hands-on with the equipment, including a special foam we use to put fires out sometimes called CAFS. I was also given the chance to have a go at operating the pump! This was a little insight into how much our pump operators need to know and how to work such a large piece of machinery… This insight has definitely encouraged me to want to progress to being a pump operator too! 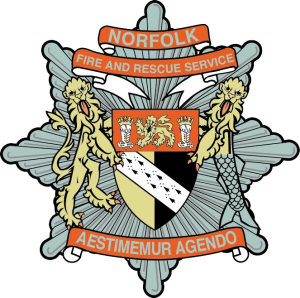 I was quite chuffed to be asked if I could give an interview on radio Norfolk as part of their fire week campaign, they have been trying to help us recruit more retained firefighters. So after a long weekend I hauled myself out of bed on Monday at about 5 (until I joined fire service I didn’t know 5am existed,) to go to Norwich to meet Nick Conrad. What a lovely guy. He is giving almost his entire morning show over to the fire service all this week! We spoke about what it was like to be a woman in the fire service and how easy it is for anyone to just fit in. If you want to listen to it you will have to fast forward to about 30 mins and 30 second in but there I am.